Preston Bus Station has been listed, but this doesn’t mean that it’s future is secure and that we can forget about it. Great care needs to be taken when considering its future. The building could still be demolished if the council finds the right buyer for the site and can convince the government that it is in the best interests of the city for the area to be free of all existing structures and other impediments. Attention must also be paid to any remodelling of the building; the city needs a thoughtful, contextual response rather than an overpowering and gratuitously flamboyant solution. In recognition of both the listing and popularity of the building, there will be a procession on November 2nd. The Bus Station had proved to be well thought of and important to the residents of Preston, and this is a chance to demonstrate the collective desire for a well-designed and viable future for the building. Continuity in Architecture in collaboration with Gate 81 will make a contribution to the procession, and as with all of the activities so far, the focus is upon the celebration, recognition and acclaim, rather than aggressive and antagonistically making demands and ultimatums. Our involvement is a huge model of the building; this will be carried in sections through the streets with the intention of creating recognition and delight. So, we will meet outside the Corn Exchange at the bottom of Lune Street at 11am on the 2nd November, this will allow us to congregate before processing along Friargate to the Flag Market at 12 Noon. Please join us. It is with great delight the Continuity in Architecture can confirm that Preston Bus Station has been granted Grade 2 listed status. CiA have, with Gate 81, actively supported the campaign to enjoy the building, and we hope that this will mean that we can take delight in it for many years to come. Don’t forget the planned procession to celebrate the Bus station, which will parade through the City Centre on November 2nd. “English Heritage is very pleased that the Heritage Minister has agreed with its advice to list Preston Central Bus Station and Car Park at Grade II. A dramatic building which combines innovation with architectural panache, the Bus Station fully deserves this marker of special recognition. With an unusual blend of New Brutalist architecture mellowed by the curves of the roof and the sweeping ranks of the car park, this ‘megastructure’ was designed to recreate a sense of the monumental within the British town scene: it is a landmark in the innovation of transport-related buildings as well as a landmark of Preston. 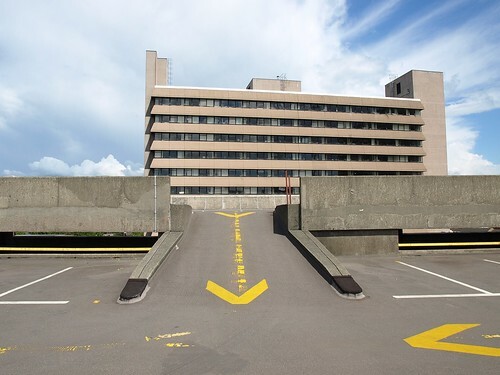 The Heritage Minister’s decision recognises the ingenuity with which the car park and the bus station are combined – strikingly uniting simple forms with the details required by a building with a heavy-duty function. It is a bus station which aspired to the glamour of other forms of travel, combining rational modernity with expressive architectural forms. During a time of optimism in progress and modernity, it was devised to provide the added facilities needed by the town as well as long-distance services made possible by the opening of the M6 and gave Preston a unique place in coach travel. Preston Bus Station is truly remarkable; the boldness of vision, the ingenuity of the design, the attention to detail and the aesthetic impact mark it out from the vast numbers of public buildings built since the Second World War. The Twenty-First Century city is a combination of two different ideas; the traditional city of streets and squares, and the modern city of isolated elements surrounded by parkland. The traditional city is really composed of spaces, which are lined with buildings. So, for example, the primary street within an urban environment is a long thin space through which people travel, which is bounded by structures that face onto this space. The shapes of the buildings are somewhat deformed to accommodate the pure nature of the street, and thus it is the space which is the predominate element of the composition. The city-in-the-park is the opposite; isolated buildings set with open land, thus emphasising the building rather than the space, which just surrounds the structures in an ill-defined manner. Preston, a small provincial city in the north west of England is no exception; it has evolved into this awkward mixture of the traditional and the modern. Neither situation really responds or compliments the other, and so the city has grown into a collection of individual structures and spaces. Preston is well positioned on a ridge above the flood-planes of the River Ribble. This line or edge, known as Fishergate, is part of pre-Roman route which crossed the country, and intersects at the Flag Market square, with a north-south track, Friargate, which was formed by its connection with the lowest crossing point of the Ribble. The Minster marks the eastern end of the city centre, while the train station is positioned at the western point and Fishergate is stretched between them. Close to the Minster are the open Flag Market, the Harris Art Gallery, the Victorian cast-iron covered markets and the Town Hall. These civic elements are testament to the wealth of the city. In some respects it is a typical industrial city, the eighteenth and nineteenth centuries brought massive expansion, and by 1867 it possessed seventy factories. This rapid development destroyed many of the mediaeval structures, but the pattern of the city centre, to the most part, was retained. Indeed, many of the small streets or weinds to the south of Fishergate reflect the pre-industrial routes and field patterns. Gate 81 is a series of projects that intends to raise the profile of the building, and therefore increase the chance of saving it from the intended demolition. The latest project was a one-day charrette hosted by BDP Architects, ironically the architects of the original building and the now-abandoned Tithebarn shopping centre that was intended to replace the building. Academics, and students from the schools of architecture in Manchester, Liverpool and Central Lancashire, as well as professional architects and designers attended the charrette. BDP’s chairman David Cash, who quite romantically remembered the time that BDP was still in Preston and the legacy of the George Grenfell-Baines, launched the event. Kevin Rhowbotham delivered the key-note talk, well, call-to-arms. He invoked the memory of Collage City and pressed us all to consider the dialectical opposition of the Object and the Field, and how each can distinguish the other. Five groups were created, each contained a mixture of professionals and students, and each approached the problem of how to revitalise this area of the city of Preston in a distinct and individual way. However, what linked all of the proposals was the appreciation that the project is much larger than just the remodelling of the Bus Station; it is an Urban Regeneration problem. All of the proposals considered the link between the city centre and the building, the hinterland to the east and relationships that exist between the key elements of the urban environment. Preston’s Indoor Market is situated within a dark and somewhat isolated building, squashed beneath a carpark next to the Ringroad. This group considered the Bus Station as a perfect venue for the new market; it would be easily accessible and very easy to support. The areas behind the building could accommodate allotments and market gardens, while the concourse could hold performances and other communal activities. The top floor of the building also offers opportunities for growing stuff. The element of time and evolution was an important aspect of this project. This group considered the possibility of creating a direct link between the city’s cultural buildings and the Bus Station. By removing the substandard structures next to the concourse, a vista or connection could be established. This combined with moving all of the bus movement to the rear or east side of the building would create a collection of public spaces that could naturally evolve from temporary to permanent use over the course of a couple of decades. People need a reason to visit a place and therefore this group asked what Preston City Centre was missing. It is widely acknowledged that most casual city-centre shoppers follow a distinct circular route around the shops. If this circuit included a substantial flagship department store to the east of the Bus Station, that is the non-city centre side, then shoppers would be actively dragged through the building en-route. 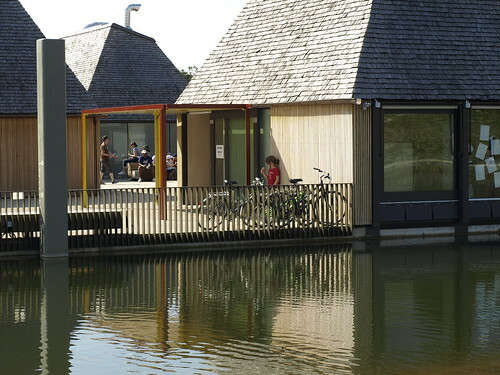 This would act to invigorate the building and any activities would naturally evolve within it. Preston Bus Station is dramatic symbol of the city. When seen from the ring road it appears as a substantial and protective wall. This group considered the effect that extending the building would have upon the urban environment. To the north, it would recreate the connections that have been lost by the intrusion of dual carriageway, and to the south, relationships could be re-established with Church Street. The area of land to the east, beyond the massive wall could be considered as a garden of lost memorabilia. In December 2012 Preston City Council voted ‘in principle’ to demolish Preston Bus Station and replace it with a surface car park. This building is a major cultural landmark and it should be preserved and creatively adapted to serve the city. It could act as a key building and public space to make Preston accessible and temper the decay that is affecting the city. BDP Architects will host a charrette on Friday 28th June 2013, at their North West office to discuss ideas for the future of this building and the urban area surrounding it. The charrette or workshop will be held in BDP’s Manchester offices in Piccadilly Basin. Key members of their architectural and urban design team will contribute to the discussion. They feel that this is a very important project, both locally and nationally. The state of panic that now exists in Preston is symptomatic of the reaction not only to the recession, which has hit the North particularly hard, but also to the change in shopping habits that the digital revolution has caused. How the post-industrial city will have to adapt to an uncertain future is one of the most pressing issues for architects and designers at this point in the twenty-first century. Preston Bus Station was constructed in 1969, and was designed by BDP. It was built at a time of great confidence; it was, after all, the same year as the first Moon landing. The building resembled an airport lounge, testament to the importance that was placed upon it by the people of Preston. Modernist buildings can possess great quality and worth, and can contribute to the collective memory of a place. If we are not careful, we will regret the loss of many of them, just as we regret the loss of many older structures that were torn down in the name of progress. Certainly the Bus Station is very much a symbol of Preston, if it is lost the city will lose a famous landmark and part of its optimistic heritage. This charrette is open to all, architects, designers, and students as well as anyone else who is interested in the future of the building. Contact Sally Stone for more details or to discuss this further: s.stone@mmu.ac.uk. Gate 81 is a project that intends to bring to greater attention the plight of Preston’s Bus Station. There has been a considerable amount of negativity surrounding the future of the building, and this is our attempt to bring some optimism to the situation. To this end, we are staging a series of events to both raise the profile of the building, and to generate ideas for the future of this troubled building and the urban area that surrounds it. The first, which was held on May 11th, was an open workshop, collection of lectures and other happenings that was held on the concourse of the Bus Station. Gate 81 is supported by: The Arts Council, Manchester School of Architecture, They Eat Culture. The Gate 81 project hacklab/workshop/charette has been arranged for May 2013. Email for info@gate81.com if you are interested in taking part. Continuity in Architecture is almost twenty years old. It is something that we would like to celebrate and we fully intend to mark the occasion with some sort of jamboree or other such event. Look out for further posts. Over the years we have conducted projects in many different locations: Palma, Venice, Barcelona, Dubrovnik, Dublin, Manchester, London, Valencia, Sant Sadurni, just to start with. But there is one location that we keep coming back to, it is a place that through position, evolution, history and neglect has a huge amount to offer us in Continuity in Architecture: it is of course: Preston. We have produced some marvellous proposals for the place, from bridges to tunnels, new urban squares to department stores, almost non-existent interventions to massive demolition works, all of which have their basis in the understanding and translation of the qualities of the area. “Preston is full of potential for development, with proposals for major investment across the city. However, there still remain pockets of obscure leftover land and neglected plots that could- with imagination and new thinking- accommodate a host of functions, respond to local needs and provide a counterpoint to these wider investment proposals. Held for the first time in the North West, this design competition asks architects, planners, artists, engineers and landscape designers to nominate an existing over- looked site in Preston and propose an idea for its improvement. All our Preston Bus Station posts. The demolition vote is being held by Preston City Council on Monday 17th December. The Council’s background documentation is here … Including costings and rejected urban design proposals. Continuity in Architecture has run two projects this year, both in post-industrial cities: Preston and Barcelona. Each city has approached the problem of how to transform the unban environment to accommodate the needs of the twenty-first century population in a different manner. As always we began with a study of the urban environment, within CiA, the emphasis is always directed towards the site, the place, the situation. Relationships that exist between the different textures within the condition of the location can be explored, translated and interpreted. And thus the form of the new is influenced not by the function but by the form of the existing, and so it is not form follows function, but form follows form. 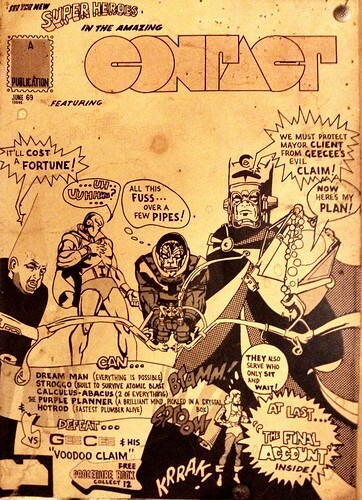 This is the cover of the June 1969 issue of BDP Preston in-house magazine ‘Contact’. BDP was founded in Preston and pioneered a team-based, democratic approach to building design in the era of the mandatory fee scale. In this illustration entitled THE INTEGRATED TEAM the BDP ethos is affectionately satirised. I believe the artist was Peter Jones, an architect in the BDP Preston office. Note the representation of the QS ‘CALCULUS ABACUS’ in what appears to be a dunce’s cap. In the spirit of the Collage City Unité/Uffizi comparison: Piazza San Marco transformed into Preston Bus Station. Over the last forty years the western world has witnessed massive social and economic restructuring. The old heavy industries, upon which our society was constructed, have collapsed. Countries such as the UK and Spain, once the workshops of the world, are now reliant upon the new service and information-technology industries. The urban areas within these countries contain a vast wealth of memory and experience. We need humility in the face of such grandeur of industrial legacy if we are to construct new elements in these neglected areas. Within the cities of the industrial revolution a new form of spatial production is needed to invest the dying urban patterns and decaying fabric with meaning. At this important juncture, we need to understand the nature of human interaction, the consequences of cross-disciplinary communication and experiences, and the affect that this has upon events and environments. The blurring of boundaries between different activities, subjects and the level of interaction starting to be developed between specialities means that old ideas of space, form and use are now being questioned. This means that concepts that would have sounded barmy forty years ago have become common practice. Massive advances in technology have facilitated this, and at the beginning of the second decade of the twenty-first century, our pluralistic both/and society is now in a position to understand and take advantage of the consequences of this. The manner in which most people now operate encourages them to actively embrace mobile technology. Wireless systems mean that we are no longer constrained by cables and sockets and big, deep pieces of machinery. This will allow us to further rethink the urban, the working, and the domestic environment; environments in which technology will propose itself as the architect of our intimacies. Continuity in Architecture will run two projects both in post-industrial cities. Each city has approached the problem of how to transform the unban environment to accommodate the needs of the twenty-first century population in a different manner. We will examine the qualities and character of the places before making design proposals. The prospects of the Barcelonese worker remained the same throughout the nineteenth century: grinding, brutish, and without much hope of change. Statistics altered and demographic shifts were seen: for instance, the more machines were used in the mills, the more demand there was for women to run them, since machinery did not require as much physical strength, and women could be paid less. But the vile calculus of human misery was unaltered… They lived cramped in garrets and basements, without heat or light or air. Midcentury Barcelona made Dickensian London look almost tolerable; Cerda` found that its population density was about 350 people per acre, twice that of Paris, and that workers had a living space of about ninety square feet per person.